Optical fiber provides a cost-effective solution for long coaxial cable runs in GPS systems. 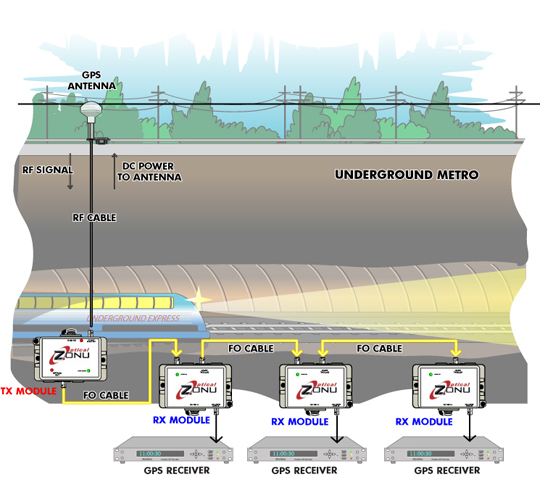 The Optical Zonu GPS over Fiber Optics System allows signals to be carried from an antenna to a GPS receiver with minimal signal degradation over a non-conducting dielectric glass media. This system provides a completely transparent cross-site connection between an antenna and receiver. As is the case in many types of in-building environments, networks require accurate clock synchronization. 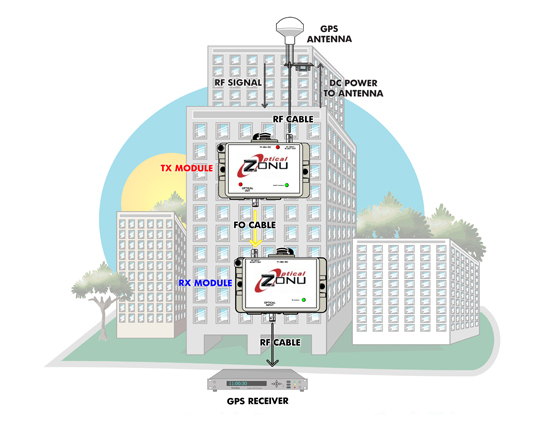 By utilizing broadband RF linear (analog) over Fiber Optics (RFoF) Technology, Optical Zonu GPS over Fiber Optics Links provide easy to operate, low cost and reliable solutions that enable GPS signal distribution using fiber optic cable. The broad bandwidth (20 MHz to 3.0 GHz) of the RFoF transceivers used in our GPS over Fiber Optics Link allows transmission of the two main signals in the GPS band, L1 and L2, at 1575.42 MHz and 1227.6 MHz respectively. This GPS over Fiber Link is designed to offer a low noise figure by integrating a built-in LNA with Lasers featuring low Relative intensity Noise (RIN) and low loss broadband matching, in order to optimize the Link performance. 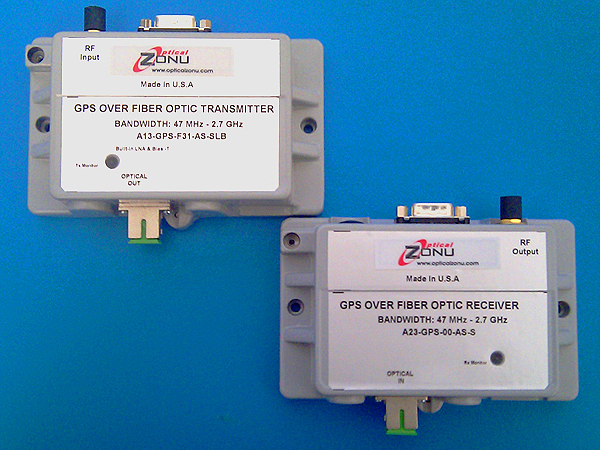 Optical Zonu’s GPS RFoF Link consists of stand-alone analog (linear) transmitter and receiver units. Each module is housed in a compact (3 x 5 x 1.5 inches) metal ruggedized box which allow convenient installation in small spaces. Both units are powered via a DB-9 plug using +12 Volts DC (optional power supplies are available upon request). Optical Zonu’s GPS RFoF Link is an ideal solution for providing GPS timing and reference signals over fiber optic cable. It acts as a low loss extender between the GPS antenna and GPS receiver in places where GPS signals are otherwise unavailable, or where running long coaxial cable lines is impractical. This segment addresses the most basic of all GPS applications, which requires point-to-point links over fiber optic cable. A link consists of transmitter and receiver modules. Both modules are packaged in a semi-ruggedized, dust-tight, cast metal housing. The transmitter has a built-in LNA with Lasers featuring low Relative intensity Noise (RIN) and low loss broadband matching, in order to optimize the Link performance. The transmitter also has an optional Bias-T to provide electrical power to the GPS Antenna. Specifications for this must be provided to the Factory, so OZC Support Engineering may determine a customized solution and the correct configuration. The maximum RF input signal into the transmitter is +10 dBm and the RF interface is via a 50 Ohm SMA connector. The standard optical connector is SC/APC (FC/APC is also available upon request) for low back reflection applications. Each unit is powered through its DB-9 port and a power supply of +12 Volts DC is required to operate it safely. An optional RS 232 data modem, alarm and monitoring functions are all also available through a DB-9 connector. A Manual Gain Control, via a potentiometer accessible from the top of the box by a small screw driver (or “twiker”), to ease field integrations, is also available. This type of link is used for sending GPS signals from a single source to multiple receivers which are connected sequentially. Common examples of such applications include subway, underground mine and other long tunnels. Fiber optic transmitter and receivers are packaged in semi-ruggedized, dust-tight, cast metal housings. An optional outdoor housing is available upon request. The transmitter has a built-in LNA with Lasers featuring low Relative intensity Noise (RIN) and low loss broadband matching, in order to optimize the Link performance. The transmitter also has an optional Bias-T to provide electrical power to the GPS Antenna. Specifications for this must be provided to the Factory, so OZC Support Engineering may determine a customized solution and the correct configuration. Receivers have built-in optical splitters which are optimized to tolerate the minimum amount of signal loss. The maximum RF input signal into the transmitter is +10 dBm and the RF interface is via a 50 Ohm SMA connector. The standard optical connector is SC/APC (FC/APC is also available upon request) for low back reflection applications. Each unit is powered through its DB-9 port and a power supply of +12 V DC is required to operate it safely. Optional alarm and monitoring functions are all also available through a DB-9 connector. A Manual Gain Control, via a potentiometer accessible from the top of the box by a small screw driver (or “tweaker”), to ease field integrations, is also available. Approx Size: 3 x 5 x 1.25 in. Note: Please contact factory for additional options such as built-in Bias T, multi-fiber compatibility, and different installation configuration involving multiple receivers.